Hundreds of aviation fans witnessed the long-anticipated unveiling of Fast Eagle 102 at Midland International Airport on August 27th. The Commemorative Air Force (CAF) hosts the annual AIRSHO and began by highlighting this historic aircraft. This F-14 Tomcat launched from the USS Nimitz on August 19, 1981, as part of a routine combat air patrol and was ordered to intercept two Libyan Sukhoi SU-22 fighters that had taken off from a nearby air base. As the Tomcats reached the intercept zone, one of the SU-22’s fired a missile that the Tomcats evaded. As the Sukhoi’s split and passed the Tomcats, both F-14s turned and returned fire with Sidewinder missiles. Fast Eagle 102 earned the first kill with 107 the second, splashing both enemy fighters. This dogfight was the first shoot down by an F-14 Tomcat. The retired aircraft rested in Midland under charge of the CAF and continued to deteriorate. The FDVG answered the call to restore the Tomcat in its original form as a museum piece. Several volunteers logged numerous hours of sanding and painting, many of them from VF-41 that had worked on that aircraft in its heyday. Their hard work and dedication made this one of the FDVG’s proudest projects of naval aviation historical preservation. The FDVG members on hand were thrilled with the arrival of Vice Admiral (ret) David “DJ” Venlet and his lovely wife Bunny. Venlet was the RIO in 102 during that shoot down. The then lieutenant went on to serve in critical roles such as Patuxent River and the Pentagon. The Admiral worked behind the scenes for weeks prier to the unveiling advising FDVG on accuracy and canopy design. Vice Admiral Venlet is the program executive officer for the F-35 Lightning II Program. He previously served as commander Naval Air Systems Command, headquartered in Patuxent River, Md. Other flag tours include program executive officer, Tactical Air Programs and commander Naval Air Warfare Center, Weapons Division, with responsibility for Navy weapons and systems RDT&E and fleet support capabilities at China Lake and Point Mugu, Calif. He served as NAVAIR assistant commander for Test and Evaluation, and for Shore Installation Management. 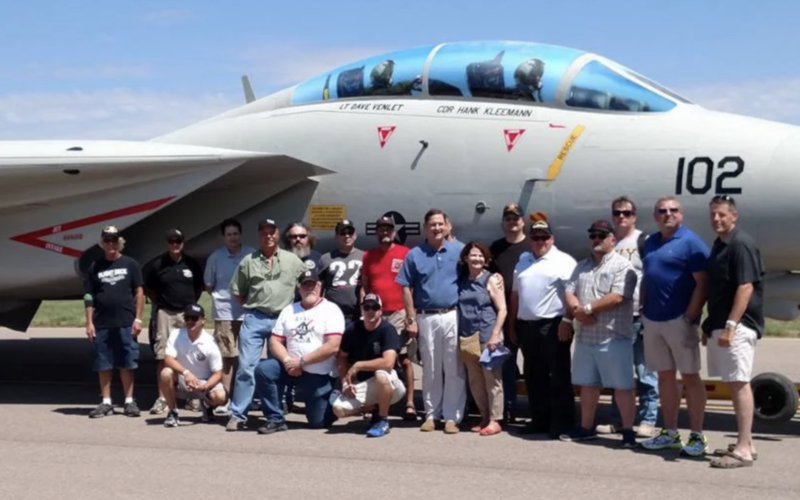 Fleet tours include VF-41 as an F-14 Tomcat radar intercept officer embarked in USS Nimitz. He wears the distinguished Flying Cross for action in VF-41. After redesignation as a naval aviator he flew with VF-143 as an F-14 pilot embarked in USS Dwight D. Eisenhower and with VF-101 at NAS Oceana as a Tomcat instructor pilot and A-4 adversary pilot. Tours in Naval Air Systems Command include Strike test pilot at Naval Air Test Center, Patuxent River, the F/A-18 program in various capacities including class desk officer and deputy program manager. He was executive assistant to the commander, Naval Air Systems Command and served as program manager for Air-to-Air Missiles involving AIM-9X development. Venlet is from Pottstown, Penn., and graduated from the U.S. Naval Academy. He is a graduate of the Naval Postgraduate School and US Naval Test Pilot School and is a member of the Society of Experimental Test Pilots. He has a BS in Systems Engineering and MS in Aerospace Engineering.